This year’s winter sports gear brings a whole new meaning to featherweight, with ridiculously lightweight boots, helmets, skis, jackets, and even fat bikes. Breakthrough technology has filtered into the Nordic ski market, and gadgets still captivate outdoor adventurers. Take a look at some of our top picks for the season. 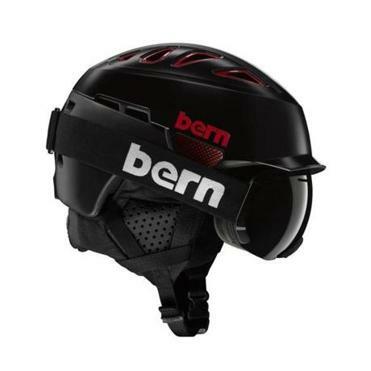 Duxbury-based Bern Unlimited has released the Heist Carbon (men’s) and Heist MB (women’s) helmets, which have liquid foam padding, energy-absorbing ribs, and impact armor in critical areas, making them comfortable and better able to protect your noggin in case of a spill. The helmets have Boa dial adjustments on the back and 16 vents on top to help regulate temperature. Choose from brimmed or non-brimmed versions. The Diabla/Diablo kids’ helmets offer the same technology in pint-size proportions, and can be used as bike helmets come spring (just remove the ear flaps). $199.99 (Heist Carbon MB), $139.99 (Heist), $49.99 (Diabla/Diablo). 781-582-8125, www.bernunlimited.com. Stick a Domio speaker on your helmet (left) and create a robust, surround-sound experience, but don’t worry, you’ll still be able to hear your friends chatting, riders coming up behind you, and the shush of your own skies underfoot. This small puck-shaped speaker, made by Toronto-based Elevety, produces a rich listening experience inside the helmet only without blocking out the ambient sounds around you. Your ski or snowboard helmet serves as a sound board, transferring the music around the helmet’s shell and to your inner ear, creating an immersive experience. The Domio app lets you dial in the bass, treble, and other settings. Come summer, throw the Domio on your bike helmet. The shockproof and waterproof device hits stores in December. $129. www.elevety.com. Slip into Fischer’s latest ultralight alpine touring (AT) boot, and you can happily ski all day. The Travers Carbon (men’s) and My Travers (women’s) boots have a beefy Velcro strap and an easy-to-use Boa closure system with pulleys and cables that make for a more comfortable and dialed-in fit, distributing tightness across the forefoot. The boot’s carbon sole plate and thin built-in liner help shave weight and make this backcountry boot one of the lightest on the market — just 2.2 pounds per boot (size 24.5). Its 80-degree range of motion makes uphill climbing a breeze, while the shell and sole offer ample stiffness to maintain control on descents. Other bonuses: It has a heat-moldable liner, built-in waterproof gaiter, and easy-to-operate ski/walk lever. Go to Black Mountain Lodge in Jackson, N.H., to buy or rent these boots. $999.99. www.fischersports.com. Seattle-based Line Skis has released a new Sick Day series, plus the women’s Pandora and kid’s Gizmo skis that will be at home on East Coast slopes. The men’s Sick Day 94 (left, $625) can tackle powder, groomers, and trees with ease, thanks to its moderately rigid built and proprietary Magic Finger Filaments that run tip to tail. The versatile Pandora 95 ($750) can handle any conditions, but shines on groomers and when threading through the trees. With maple wood underfoot and aspen at the rockered tips, it holds its own on edge or while cutting through chunky snow. The kid’s twin-tip Gizmo (right, $300) can take a beating, and let your mini-me shred the same lines along with you. The rockered ski has the same flex pattern front and back for added control riding while forward and backward. 888-546-3754, www.lineskis.com. Rossignol partnered with Fischer to create a new Nordic binding that offers cross-country skiers quick and easy adjustability, and better stability, power transfer, and ski control. The Turnamic binding, which is compatible with any NNN boot, mounts to an integrated plate, enabling skiers to easily adjust the binding without tools for better grip (slide it forward) or glide (slide it back). The heel and toe plates move simultaneously, in 5mm increments. The binding also offers a step-in/step-out feature, letting skiers clip into and release from the bindings with just a twist of the Turn Lock mechanism above the toe. Try Rossignol’s new R-Skin Race ski (left), a classic-style versatile ski for racers and recreational skiers that performs well in all snow conditions. The ski’s mohair and acrylic base helps the skis grip the snow (optimizing the kick without requiring wax) and last longer. The mohair inserts can be easily replaced when needed. $325 (R-Skin Sport) to $575 (R-Skin Race). www.rossignol.com. K2’s new Maysis LTD boasts a heat-moldable liner, an all-leather upper, and a durable Vibram sole for good traction on the board and when walking to and from the slopes. The new Endo 2.0 construction adds durability and response, while the double Boa system enables riders to dial in a better fit — one Boa dial lets you adjust liner tightness and heel lock, while the second one cinches down the lacing cable. The boots have flex areas around the ankle to add extra comfort and help alleviate pressure points. The Intuition SpaceHeater liner contains a silver reflective material around the toes and instep to reflect body heat and keep your feet toasty. Men’s 7-13. $439.95. 800-985-2191, www.k2snowboarding.com. Mini rippers can stay dry and toasty with Helly Hansen’s latest Lifa merino baselayers, made from a blend of merino wool and the company’s own version of polypropylene. The Lifa merino tops and bottoms feel dry and non-itchy next to the skin, but offer the warmth of wool and wicking capabilities of Lifa. The elbows and knees of the kids’ baselayers (toddler size 4 to youth 3) have fleece reinforcement. Helly Hansen has also released new junior jackets, including the waterproof, windproof, and fully breathable Junior Aura Jacket for girls and Junior Boundary Jacket for boys. Both have full insulation, a detachable hood, pit zip vents, a powder skirt, wrist gaiters, and a ski pass pocket on one sleeve. Both work with the new Junior Powder Pant, which is also waterproof and breathable, and comes with snow gaiters and extendable legs to increase the number of seasons they can be worn. $75 for baselayer set; $220 jacket; $150 pants. 866-376-4183, www.hellyhansen.com. Patagonia’s new Micro Puff Hoody offers the packability, warmth, and coziness of a down-filled jacket, while providing the benefits of a synthetic piece: It still keeps you warm when wet, thanks to its PlumaFill insulation. The Micro Puff’s quilted chambers contain strands of fine synthetic filaments, rather than feathers, that trap heat and provide a toasty layer without leaving you feeling clammy. Its nylon ripstop Pertex Quantum shell blocks wind and has a water-repellent finish. The ultralight jacket weighs just 8 ounces (women’s XS) and packs into a hand pocket so you can stash it in a hydration or ski bag when you need to shed a layer. Fit leans toward the roomier side. $299 (men’s and women’s versions). 800-638-6464, www.patagonia.com. Kulkea’s lift-friendly Micro Pack will appeal to organizers and lightweight packers who don’t need a bag with a cavernous main compartment for a day on the slopes. The well-thought-out pack, designed in Westwood, has a tucked-away compartment on the back for stashing a wallet, car keys, and other small valuables, a pocket on top for storing goggles and sunglasses out of harm’s way, an easy-to-reach zippered pocket on the front flap for quick access to snacks and hand warmers, and a larger zippered pocket under the flap for a spare layer, gloves, or lunch. The tall and slim bag intentionally lacks zippered compartments on the lower third of the bag, so you don’t have to take it off when jumping on the chairlift. Webbing and straps let you attach a helmet for aprés ski or hiking back to your car, and a mini mesh pouch on one shoulder strap stashes a lip balm within easy reach. $99.95. 781-366-0754, www.kulkea.com. Colorado-based Borealis launched five years ago — long after the fat bike craze started, but when these bikes still weighed a ton — with the aim of making a fat bike that had a mountain bike geometry and weighed less than 25 pounds. It did just that, and now makes several lines of super-lightweight carbon bikes, from the Echo GX, which has a full carbon frame built around the RockShox BLUTO fat bike suspension fork, to the new high-end Crestone Eagle XXI, a full-carbon rigid frame with the latest SRAM 1x12 Eagle drivetrain, US-made carbon rims, a 197mm hub that takes 4.8-inch tires, and a size range to accommodate riders down to 5 feet 2 inches. The 25-pound bike has a light and playful feel, and can handle any conditions. $3,089 (Echo) to $5,967 (Crestone). 320-328-2453, www.fatbike.com. The folks in Northfield, Vt., know how to make a mighty fine sock. Slip on Darn Tough’s new Mountain (women’s) and Mountain Top (men’s) socks and rest assured they’ll stay in place during your winter adventures. The over-the-calf socks have three integrated ribbing zones built into them so they won’t droop down or bunch. The merino wool material wicks moisture and lets your feet breathe to prevent overheating, and its antimicrobial properties help curb odor. $24. 877-327-6883, darntough.com. Slip Nikon’s COOLPIX W300 in your ski jacket and document your adventures. The pocket-size camera lets you capture 4k UHD video and 16-megapixel images, and then instantly share those using the built-in Bluetooth feature and the company’s SnapBridge mobile app. The W300 may not be the smallest or lightest rugged point-and-shoot on the market, but it takes superior shots (with a f2.8 maximum aperture), has an excellent 5x zoom (equivalent to 24-120mm range), and comes with a reasonable price tag ($386.95 at BHPhotoVideo.com). It’s freezeproof to -10 degrees Celsius, shockproof to 2.4 meters, dustproof and, for your summer adventures, waterproof to 30 meters. The W300 has a comfortable grip, a 3-inch LCD display, and built-in Wi-Fi and GPS. www.nikonusa.com.